The TAO Group is synonymous with trendy Asian-themed venues and eateries. The dimly-lit and “clubby” restaurant is currently one of the hottest spots in town with A-List pop and hip hop stars and celebrities in and out frequently. The Lakers are also regular customers. Thanks to Chefs Wing Joe and Jun, I had a phenomenal meal while people-watching some of the prettiest faces Los Angeles had to offer. Chef Wing Joe with Yvon Nguyen of Yvon Lux at TAO Los Angeles. The shishito peppers are spicy green peppers drizzled with the citrus-y yuzu sauce and topped with sesame. This dish is a must-try starter. The tarty, spicy, sweet, salty flavor combination was one of the most memorable I’ve had. I’m also a huge fan of yuzu which is a Japanese citrus fruit so the usage of yuzu and shishito peppers is genius in my opinion. The shitake mushrooms are served yakatori style, which means bite-sized and skewered. It’s perfectly grilled and has delicious depth. The Chilean sea bass is skewered and drizzled with miso glaze and topped with cilantro. The savory and semi-sweet from the miso is rich and goes well with the creamy sea bass. Must-try for fish fans. Thin slices of tuna sashimi are laid upon thin wonton chips topped with heirloom tomato and delicious truffle aioli. Are you thinking wonton chips and tuna, what’s so special? The description does not do it justice. The fresh and light tuna slices combined with crispy thin chips and rich truffle aioli is a huge win. This dish is a party in your mouth. 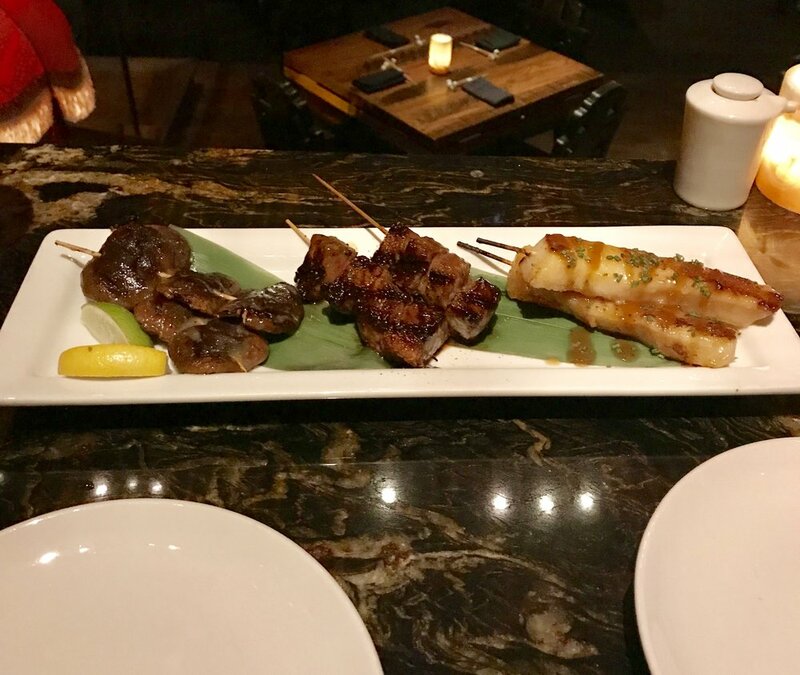 The Wagyu Beef is served as skewers of beef with a side of lemon slices. This is better for meat lovers who prefer their meat well. Rare and medium-rare eaters should order with very specific instructions to the servers. The Wagyu Rib-Eye Teppanaki is thinly sliced wagyu meat served piping hot on a skillet platter. It’s served with five of TAO’s signature dipping sauces. Although I thought the steak was already flavorful without the sauces. Order on the rarer side since it comes on the hot skillet. This Chef’s choice platter of sushi and sashimi is presented beautifully and will delight seafood lovers. The selection of lobster, caviar, tuna, salmon, oysters, and many more was a hit and was the object of envy of many guests who passed by the table and saw the delicate presentation. The Giant Fortune Cookie offers the perfect crispy shell to two decadent and cloud-like white and dark chocolate mousse. The cookie is topped with powdered sugar, rimmed with crushed nuts on chocolate. It’s also served with a side of an assortment of fresh fruit chunks including dragonfruit, oranges, grapes, and strawberries. I’m a fan of chocolate mousse so this dessert was absolutely heaven. The Chocolate Box is made out of chocolate with a molten lava cake inside. It is also served with a side of salted caramel ice cream laid upon cookie crumbs. This dessert will definitely satisfy your sweet tooth.